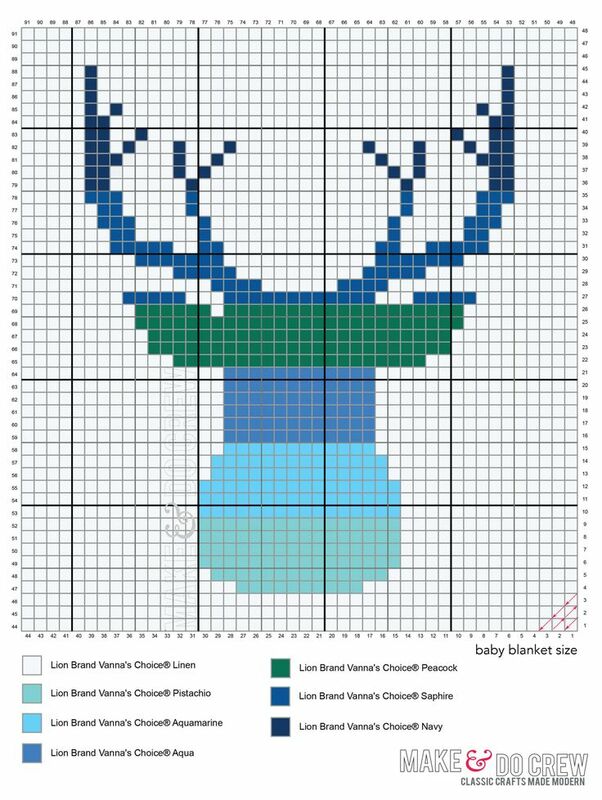 If you’ve been perusing the articles on The Craft Chair for a while, you’re aware of how much I love the tutorials and patterns available on the Make & Do Crew website. 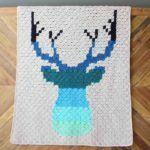 They’re interesting projects, free patterns, and I think they use crochet in a modern, unique way while still making projects accessible to everyone, from beginners to advanced. 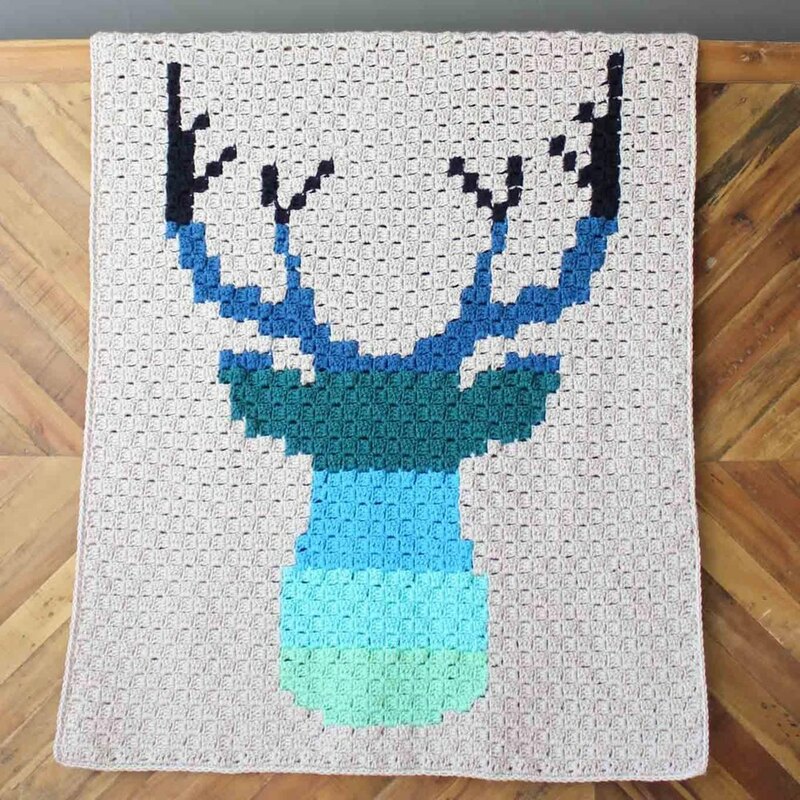 I especially love this “Be A Deer” afghan because it’s a smaller size, so you don’t have to feel overwhelmed with a bedspread afghan, and it’s a pattern that can be used for everyone — babies, kids, even adults. Hunters will love this in earth tones, babies will appreciate it in pastels, and if you’ve got a room that needs a little pizzazz, go all out with the color choices, whether it’s rainbow or ombre. Of course, if you don’t want adds and do want the instructions for the larger blanket, you can purchase the ad-free PDF of the pattern for $2.50. It comes with two graphs and written instructions, as well as some photos. And if you just want to make a small afghan, the pattern is available for free on their website. 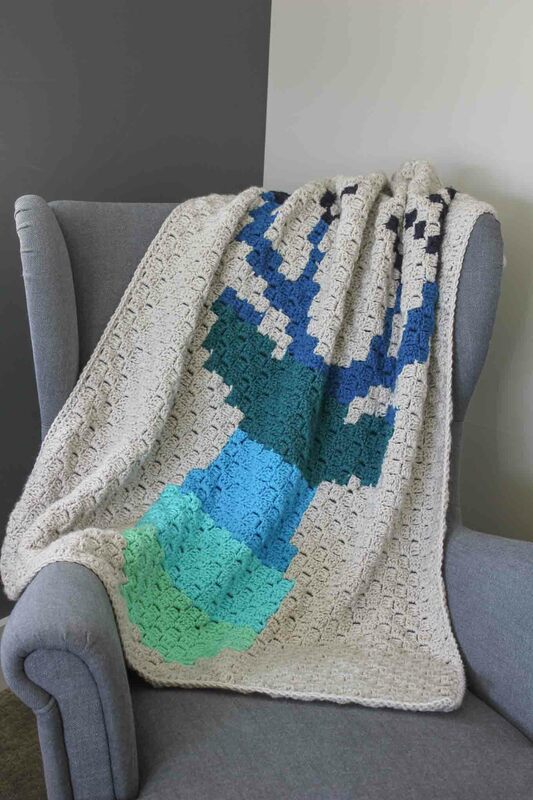 The baby blanket measures 38.5″ by 42.5″, and requires the following materials: 12 balls of yarn (the instructions break it down by color in case you are using multiples, and it recommends using Vanna’s Choice), a size H crochet hook, a tapestry needle, and a pair of scissors. If you want to check your gauge prior to beginning, crochet four and a half “tiles” and it should measure four inches. Besides the corner to corner crochet stitch (there’s a tutorial link included on the pattern page), all you need to know stitch-wise are: single crochet (sc), double crochet (dc), skip (sk), chain (ch), slip stitch (sl st), and right side (RS). If you’re comfortable with all those but haven’t tried corner to corner crochet, I do recommend finding a YouTube video if written instructions aren’t as clear. A note on the crochet “tiles”: this crochet tile contains 3 chains (ch) and 3 double crochet stitches (dc). When you consult the graph for the afghan, each square counts as one “tile”. It is noted in the pattern that it’s easier to keep track if you cross off each square as you go, starting in the lower left corner. That way you don’t miss stitches and your deer won’t be abnormally shaped. The border stitches, of course, will be looser so the blanket doesn’t stretch or pull. The end result is a hip, modern afghan that will please a wide range of individuals (if you’re so inclined to give it away), and will allow you to stretch your crochet stitch knowledge. If you like corner to corner crochet, there are more free patterns for afghans available online — check Ravelry or Pinterest. Does this sound like your new weekend project? 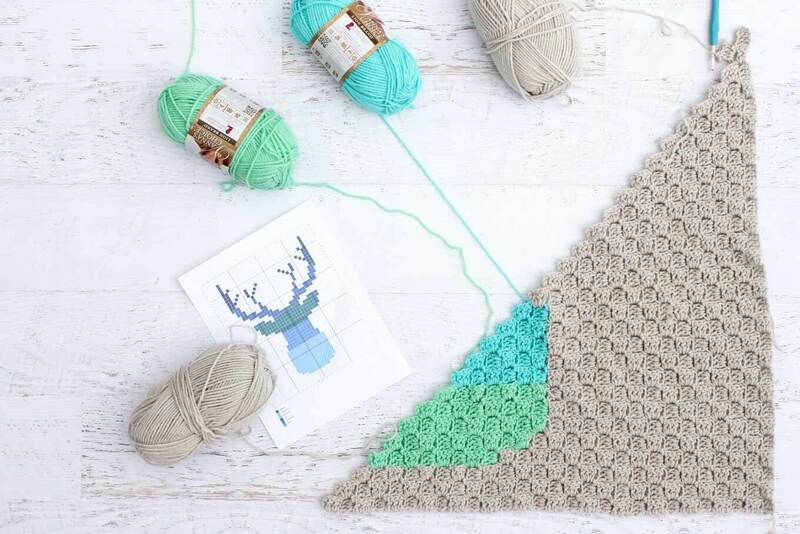 You can find the free graph for the small afghan, along with the ad-free row by row instructions and the larger graph in an inexpensive PDF on the Make & Do Crew website. There are also links to tutorials on corner to corner crochet, as well as switching between colors. Scroll through the rest of their projects for more modern crochet inspiration.